Brass bands, soloists and small collections of Salvation Army instrumentalists are scattered across the city. A variety of Christmas tunes float down the lane ways, across the stairs. This is not my first summer Christmas yet it still doesn’t seem right. Perhaps it is because I need more than a couple of weeks in the sun to replace a quarter of a lifetime of cold, bleak, grey, sometimes white festive winters. Decorations go up around the city, the radio started playing Christmas tunes long before we’d even reached December and I had finished a good half of my Christmas shopping. When you’re half the world away, it pays to be organised. Especially considering how much you’re going to have to pay to send anything larger than a postcard home at this time of year! So once again, I’ve found myself absent but the blog has never been far from my mind. It’s always, “let me just get this one thing finished and then I’ll have time” or “I’ll get it done tomorrow, I don’t have time right now”, and yet what have I been doing? For the most part, getting everything ready for Christmas of course! 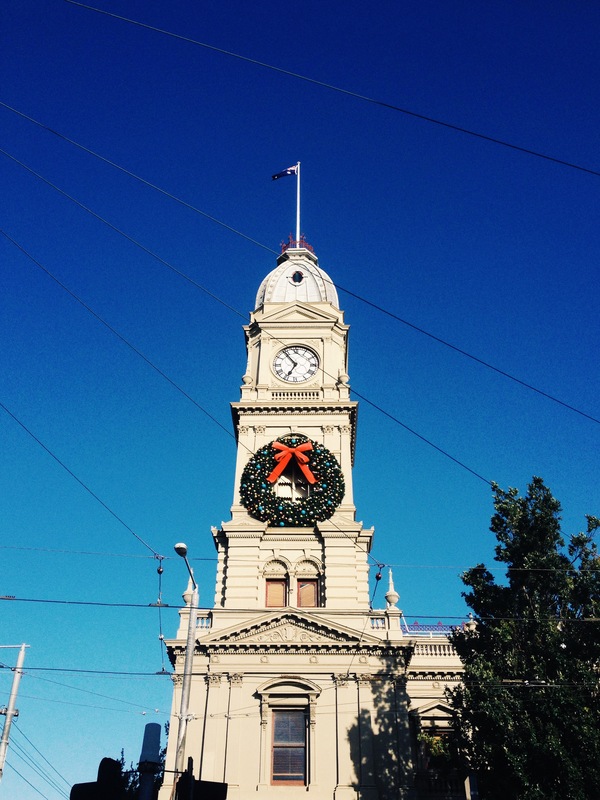 The main high street through every suburb is lined with oversized strings of bells, stars, or baubles. It’s difficult to find that festive feeling even when everything is beginning to look a lot like Christmas when the image you have in your head is something quite different. There is a part of me that long to feel genuinely cold. I mean, there were those times in the country, waking up at 4am with icy toes and a frost covered tent but by the middle of the afternoon, the need for sunscreen was still pretty high. I miss having to put on a couple of pairs of socks, a big winter coat, a scarf and a stupid hat. The days when you wake up and it’s dark, you go to work, you come home, it’s dark again. Sure, they’re fairly depressing, but getting into a warm house where you can sit around in your jumper with that now clichéd pattern, a pair of slippers on your feet, a hot cuppa in hand make it all the more bearable. I haven’t been able to rely on the weather to get me in the mood, I’ve found it elsewhere. Towards the beginning of the month we put our Christmas “tree” up. I actively encouraged the idea that we had the time, space and money to get a small, live tree in the apartment as we approached December. 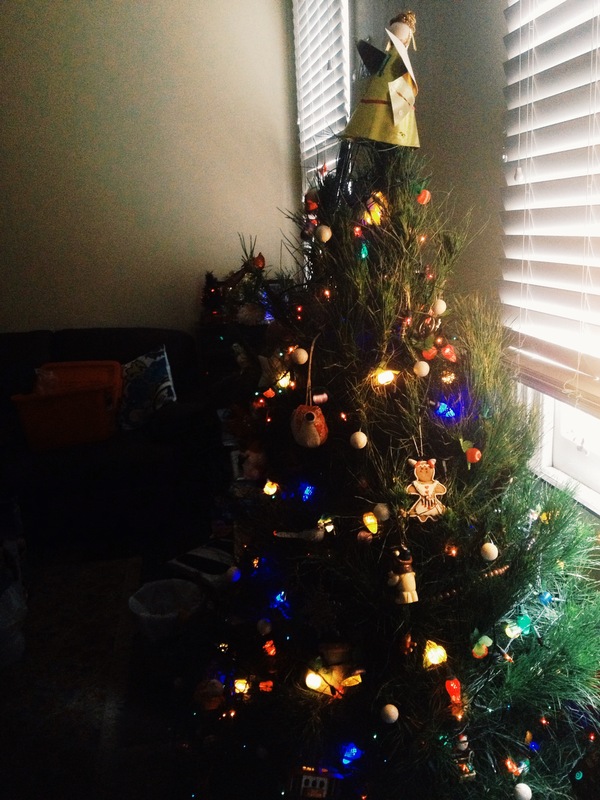 It didn’t seem quite right to have Christmas without a real tree. In the end common sense prevailed as Elena and I spent a little bit of time considering our other options. Having somebody who spends a good amount of their spare-time browsing creative ideas on Pinterest comes in very handy at times. 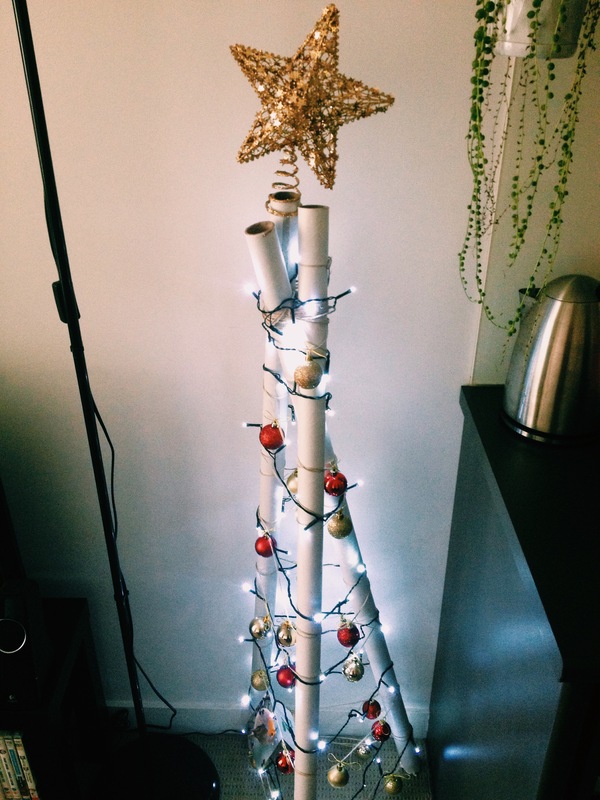 Three cardboard tubes, some twine, and a little bit of old scouting knowledge combined to give us a basic tripod that would at very least provide us with the basic tree-like shape that we’d need. A string of fairy lights, a packet of baubles and a gold star added the necessary touches and now we can pretend that we’re trendy hipsters with an artificial, minimalist tree. We’re going to bulk it out a little bit with any cards we receive this year. Hint hint nudge nudge. Our shoe-box apartment has gradually become a small factory of creative industry as the big day has drawn ever nearer. Elena is hand making the vast majority of her Christmas presents, I’ve even had a go at some of the things she’s been making as it often looks like it would either be a lot of fun or very relaxing, sometimes even both. I, on the other hand have even made the executive decision to both wrap my presents and send a few cards out this year, putting my Scrooge-like attitude to the sword in an attempt to really catch a hold of the spirit of Christmas. Most gifts for my family were purchased towards the end of November in order to give myself maximum chance of being able to get things home in time. After a little session spent mostly getting frustrated with sticky tape and wrapping paper, I had a small pile of presents that were boxed up, ready for the long journey home. Not long after our own had gone up we headed across town to Elena’s parents house for lunch and to assist with getting their home decked out for the Christmas period. Boxes came down from the tops of wardrobes. Faye, Elena’s mum, began with the good intention of throwing out some of the old decorations and I was very encouraging. The trouble was, most of the decorations were hand made with the love, attention and hours of painstaking effort that you find most of in children at school, so James and Elena had other plans, played the emotional attachment and made sure that anything that didn’t go on the tree, went back in its box. Meanwhile, the three of us made sure that the tree wasn’t going anywhere, chaining it up with meters of fairy lights, finding the space on branches to weigh it down with a pretty eclectic mix of decorations. I think my mum must have had the same train of thought as Faye did several years ago. 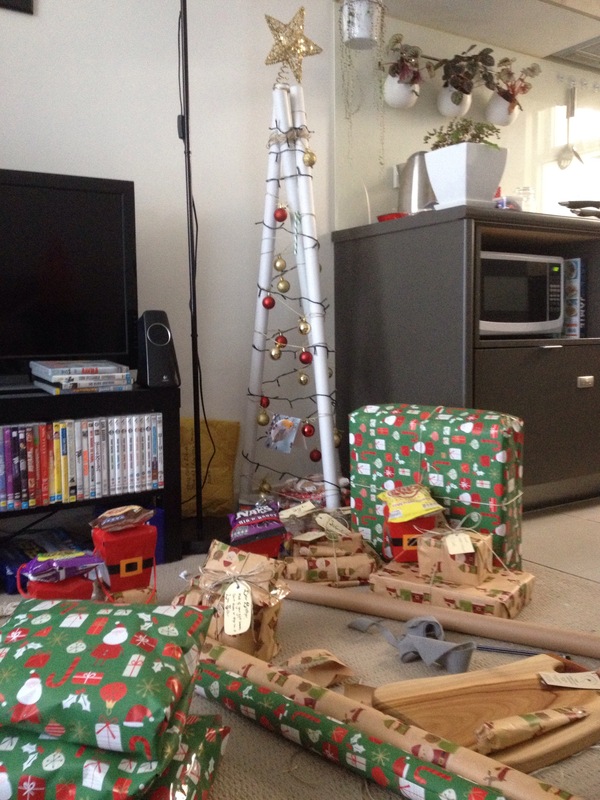 We were pulling out little wooden trains, Angels and nutcrackers that I’m sure once lined the edges of our tree. The tree was the same, but different. In the UK, our trees are more of the fir variety with thick bushy branches covered with small needles that will drop over the festive weeks and create a small blanket of vegetation on top of the carpet. This here tree had long slim needles that were not all that dissimilar to grass. The smell, which is obviously the number one reason anyone ever goes for a live tree was almost identical. Resinous, rich and full of memories. Is it, I wonder, a time honoured tradition in every household to plug the lights in behind the tree and face a twice daily struggle of turning them on and then off? All the while being buffeted in the face with that thick scent of Christmas. 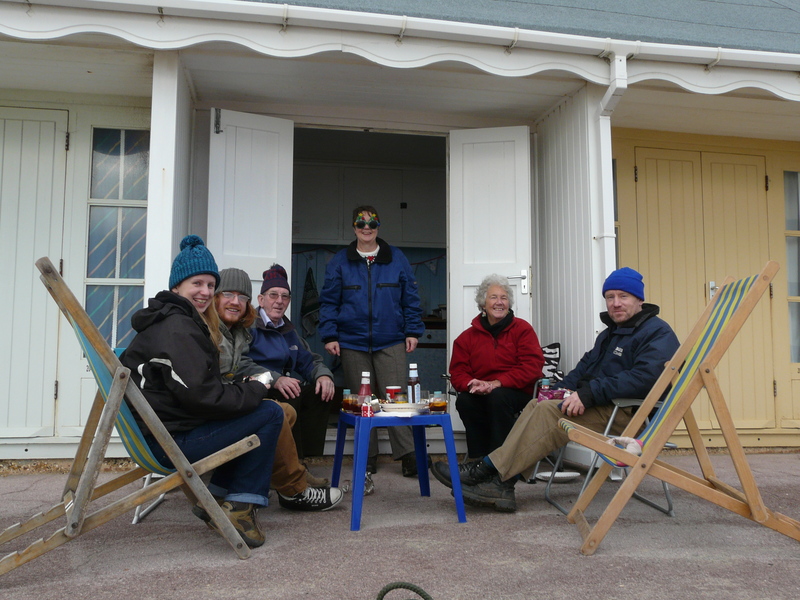 My family have already begun their celebrations, pictures have come through of the now time-honoured tradition of a trip to Bournemouth Beach to visit my grandparents. I suspect they’ll have seen more of the sand and sea than I will come Christmas itself. As you can probably gather from the above, it’s not a big event at home. Not normally anyway, I hear this year everyone is getting together on the day to celebrate. I must say, there is a part of me that does wish I could be there to share it with them but I’m not quite ready to go home just yet. Anyway, there’s already plans in place for my first Christmas with Elena. She’s already been filling me in on what their traditions are and how things pan out. It sounds like there’s going to be a lot of eating done over the next week! Having already mentioned my usual Scrooge-like attitude being cast off for this year, it will probably come as little, or no surprise to find that I’ve been feeling a lot more festive than have done in a very long time. I’ve been mostly tolerant of Christmas songs playing at home weeks before the big day. As mentioned, everything I’ve bought has been wrapped in actual paper, not just the plastic bag in came in, friends and family back home have started to receive cards sent out perhaps a little on the late side. We’re only a few more sleeps away before I can take pleasure in handing out the gifts I’ve bought for the people in my life on this side of the world, and hopefully see a positive reaction and those who I truly believe are going to make it yet another very special Aussie Christmas!